A child living in a majority world slum faces many obstacles, one of which is trying to get an education. When a family is struggling to find food, school supplies don’t seem that important. However, without the necessary supplies children who are already struggling have almost no chance at doing well in school and risk continuing their family’s cycle of poverty. Our churches have ongoing ministries to address the need for food, and through Share Christmas we address the need for school supplies. We take a practical approach that focuses on bringing the biggest benefit to those we serve. We raise $15 per child which is sent to local churches in Brazil, Thailand, and Cambodia. 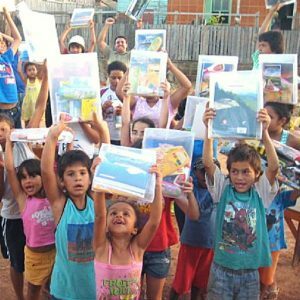 Our church plants purchase school supplies and hygiene kits (and uniforms if necessary) locally and distribute them in their own community, neighbor to neighbor. Everything is in the native language and is seen as a gift from the local church caring for their community. Also, the money being spent blesses the local economy. In all honesty, every year we struggle to meet our goals for this annual outreach. In part, we have found this is because the average donor would rather go to their local department store and purchase items to send directly. We understand that; it feels a lot better than giving $15 online. However, by equipping the local church to be the hero, rather being the hero ourselves, we actually make a greater and more lasting impact. If your church or organization would like to participate in Share Christmas please contact us to receive an information packet and promotional materials kit. Or donate today by clicking the button below! You can also visit our website for a video and more info about Share Christmas.